Engaging in indie rock melodies with grungy guitars, Ramonda Hammer are the latest to bring back a nineties alternative rock aesthetic with its clean riffs and antipodal dynamics. Fronted by the soft, though passionate vocal delivery of Devin Davis, the four-piece somehow keep things grounded with a honeyed melody that never becomes either too scruffy or drenched in an excess of reverb. The band has just released a video for “Goddamn Idiot”, which takes a comical slant by taking cues from defunct trash reality TV show Cheaters. 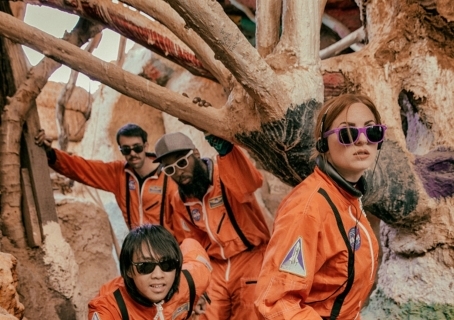 The satirical nature of the video is more on the lighthearted side, though it doesn’t in any way limit their songwriting smarts; instead, we get a band so confident in their abilities that any major contrast to their sound only helps to enhance their still-nascent careers with a lively shot of personality. Make sure to catch Ramonda Hammer at the Hi Hat on March 14.